A question asked by many nowadays is, “Are travel agencies still a thing?” The answer is quite unexpected. Though the need for travel agents dropped around the start of the 21st Century, and last through 2014, the trends have finally changed, and many are looking for Travel Agencies to sate their wanderlust. The level is not the same as before the advent of the internet, but the numbers are high still. Arranging a tour on your own is not easy, despite the connections available on the internet nowadays. The main issue is finding the right people to make your trip a reality, which includes a driver and tour guide, as well as managing food, accommodations, and managing the travel group. Travel Agencies serve as a one stop shop for all these problems, allowing the traveler to enjoy the journey. 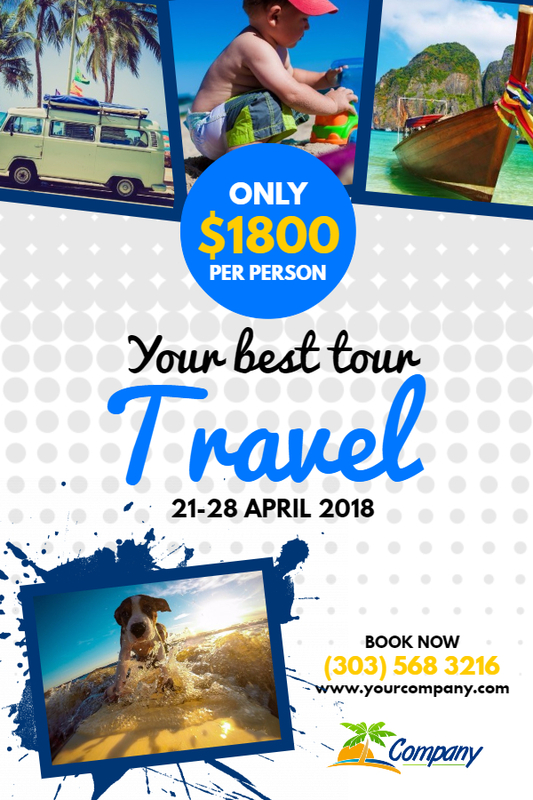 You, as a travel agent need to step up your game, as the competition is intense, and the prospective traveler has plenty of reasons to pick from hundreds of competing agencies over you. Travel conventions are not as relevant as they once used to be, and even though email campaigns are effective, you need to do a lot more work and spend much more time to get the results that you seek. The average traveler is more likely to make a decision based on a Google search rather than attending a convention. The first step, as is present in every great venture, is to forge a robust marketing strategy. You need to cover all your bases as a travel agency, and to identify your exact goals. This includes the places you cater to, mode of transportation, whether you operate locally or internationally and most importantly, your target audience. Does your travel agency cater to families, young enthusiastic travelers, or do you identify as a women exclusive travel club? 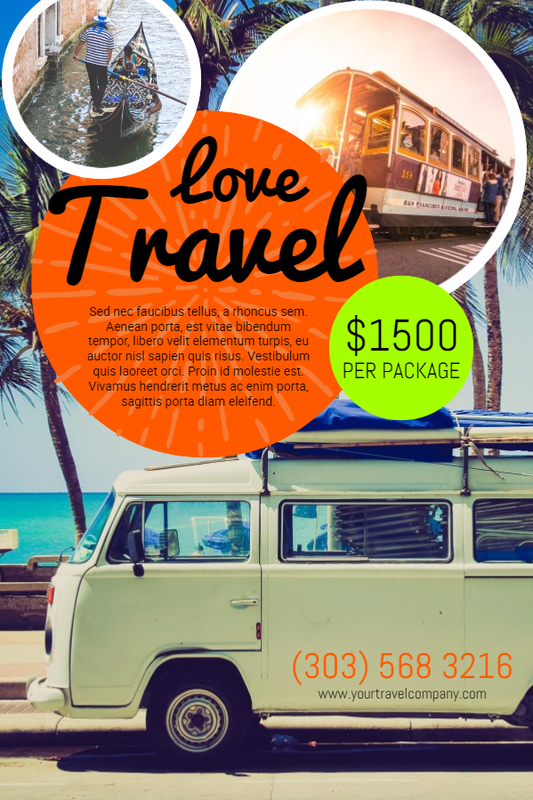 All these details form an integral part of your travel agency’s marketing strategy. No matter your marketing strategy, maintaining a website, relying on SMS and attending conventions is simply not enough, despite the fact that SMS marketing is a super effective marketing tool, but more on that later. You need to create a presence on every available forum relevant to your interest, which includes joining social media. Almost every email or SMS contact you have is present on social media, and especially on Facebook. In September 2016, Facebook had 1.8 billion active users. Your audience, despite the niche, will be present and active here. Social networks used most commonly by travelers and travel enthusiasts are Facebook, Instagram, Pinterest and Twitter. You need to keep in mind that every social media platform is different from the next one, hence your marketing strategy should be optimized to cater for each social network. We’ll look into each social network individually, and define strategies that work for each. Before we start, it’s crucial to think from the perspective of the audience. Study your target audience’s behavior, and you’ll find the answers to your questions. Facebook is the go to network for most social media users. Travelers frequently use it to share photos and videos of themselves during trips, including check-ins at key locations. Many travelers fervently wait and enjoy getting tagged in photos by others, especially if the photos were taken with a DSLR. Hence, you need to prompt users to travel with your agency, and one way is to take good photos of your previous endeavors. Share it online, and tag the travelers who were part of it. Facebook also allows you to create an event, which can be seen by the public. If they’re interested, they can choose to join or be “interested” in the event. 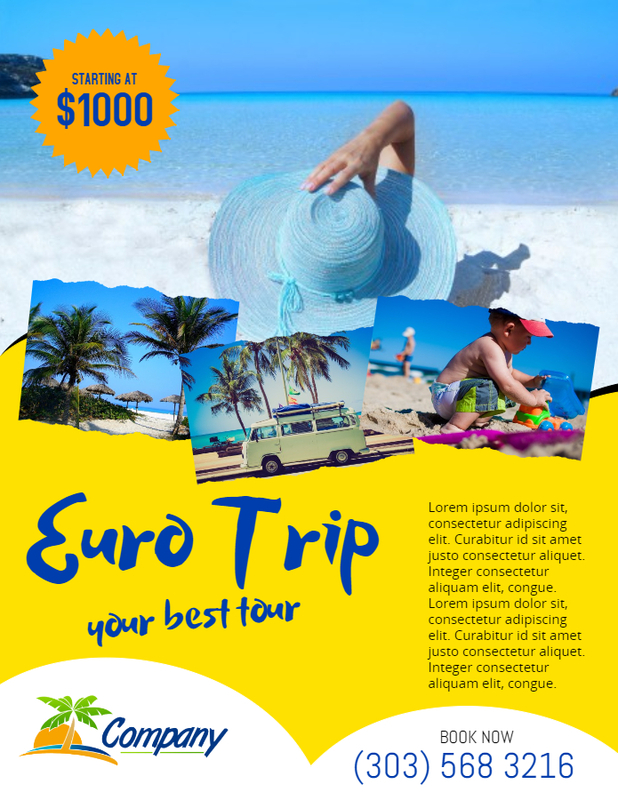 This is seen by their friends, which creates huge exposure for your Travel Agency. Twitter is more of a news sharing platform rather than a conventional social network. It’s not commonly used for photo sharing. Instead, you can use it share the latest news in your industry, as well as updates about your latest offer or trip. Instagram is the social network for millennials and younger generations. Being a photo sharing platform, it is the best place to advertise your Travel Agency. Post aesthetic and appealing photos of your tours and awaken the prospective traveler’s wanderlust. Couple up the great photos with popular hashtags, so you can get discovered easily by your audience. Some popular hashtags include #wanderlust, #welltravelled, #doyoutravel, #fromwhereistand, #ihavethisthingwithfloors, #instatravel and #traveling. Pinterest is the pinboard of the internet. Hence it’s used by travelers and prospective travelers to stock up useful information that can help in making their trip a blast, such as travel tips, outfits, top locations and ideas for food, packing and lodging. 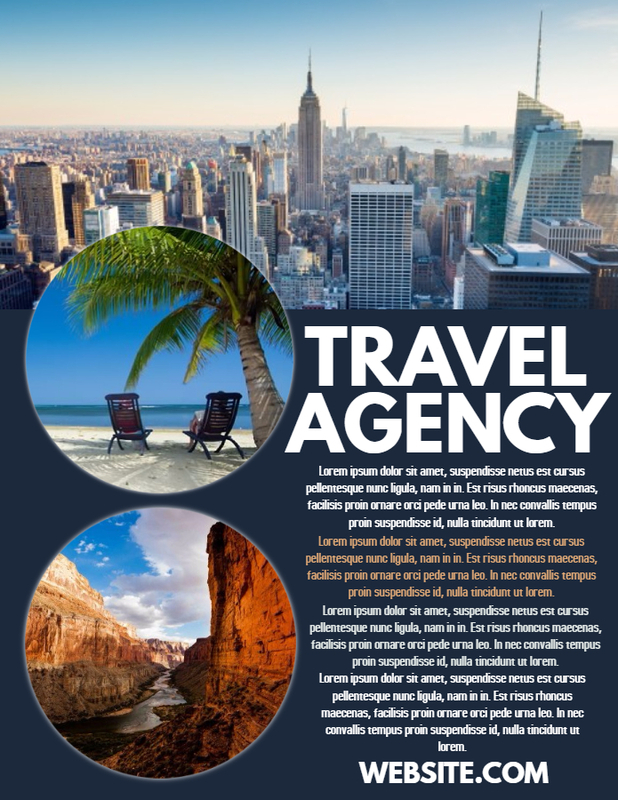 Travel agencies passionate about travel and Pinterest should create interesting and helpful Infographics, and create boards for separate tours. Creating a presence on these social media networks costs only time, and the ROI is great. PosterMyWall offers a free, online poster creator software, used to create social media content, as well as online and offline ads, flyers and posters. 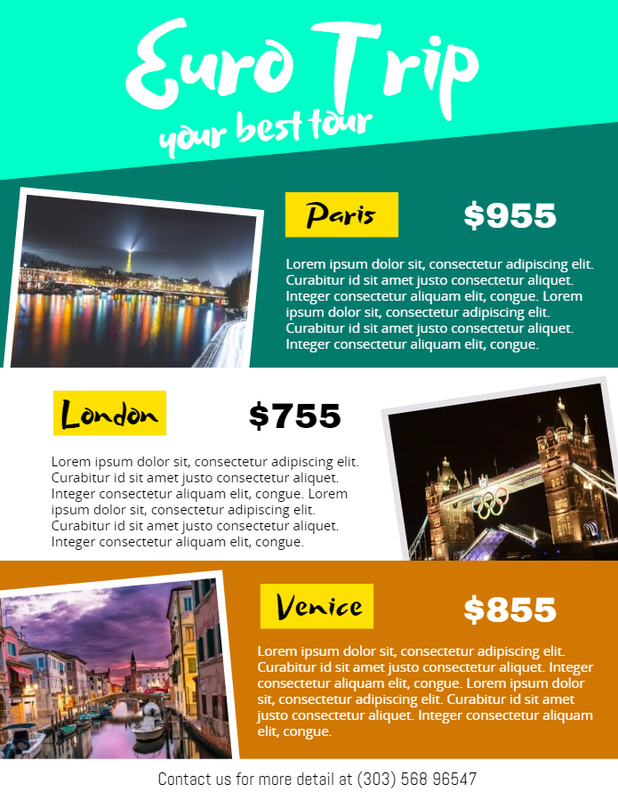 You can check our customizable travel themed poster templates for designing any kind of social media graphic. Just pick a template and start adding your details. Creating social media accounts is great and all, but you need to pull out all the stops to be on top of the competition. Many of your competitors are already entrenched well in your industry, and changing that isn’t easy. We’ll discuss 2 important kinds of online ads. Social Media ads, and Google Adwords. All the social media networks discussed above offer paid ads. Facebook also offers additional “sponsored content”, which is different from an ad. Not surprisingly, Facebook ads are the most commonly used social media ads. According to a report by Social Media Examiner, 86% of social media marketers used Facebook ads, as compared to only 18% for Twitter ads. Pinterest ad - 735 x 735 pixels, though other sizes work just as well. Google Adwords are not as straightforward as social media ads. They have a longer learning curve, and may appear confusing at first. Luckily, there is a plethora of guides and videos online that can help you become a pro. If you’re new to Google Adwords, consider checking either of the guides below. While running text ads, focus on delivering an offer to entice travelers, such as a discount on groups, a luxury ride to a scenic location or discounted holiday rates. Image ads for Travel Agencies are unlike other image ads. The imagery needs to invoke a feeling of excitement and imagination, opening up a window of opportunity of having a good time. Coupled with an inspirational one-liner, the imagery should further inspire them to travel with you. The imagery you use should essentially contain beautiful and majestic sights (think high res images of mountains, rivers, historical sights or a festival in a far off land). It should also relate with your target audience. When targeting millennials, pique their interest withexotic locations or a great trek. Families, on the other hand, would be more interested in kid-and-pet friendly and more accessible locations such as an island resort. Consider using pictures of children frolicking around in your ad. Even with Social Media, having your travel agency’s homebase, or in other words, a website, is necessary. Prospective travelers will check your social media, but many will also look for your website to find additional information absent on your social media page. Therefore, it’s essential that your website should contain complete information about the services you offer. Furthermore, many of these prospective travelers will be accessing your website via mobile. More than 50% actually. So if your website is not optimized for mobile, you’re in trouble. Nobody likes to squint or zoom in and out to navigate through your website. Many of them will hit the back button if they can’t understand the website layout, or find navigation difficult. This will result in a high bounce rate from your website. You should therefore opt for revamping your website to make it responsive for mobile. Check out these examples. Optimize images used on your website. Compress high quality content pages. Reduce plugins on your website, remove Flash. For more info, check out this guide to make your website mobile ready. Take full advantage of SMS campaigns, and send subscribed users seasonal offers as well as casual prompts, such as an inspirational quote to get their interest up. As a travel agent, you need to build trust with your potential clients, so they can be sure they’ve come to the right place. Reviews are an excellent way to establish trust, and Facebook makes this easy. Enable reviews on your Facebook page, and your past clients can come and rate your page. If the service is good, they’ll definitely give you 5/5 stars. You should also go the extra mile, and have travel bloggers write for you. Give them special incentives to travel with you, and have them review your agency. If they’re especially big in the field, and they like your service, your agency is in for a great time! Running a Travel Agency is difficult business, and until you can score a good reputation for yourself, a lot of work is in order from all fronts. If you follow all the tips shared above consistently, your agency will be successful. If you found this article useful, you may like to read up on 5 Winning Social Media Stories or 5 Tips to Get More Followers on Pinterest. You can follow PosterMyWall on Facebook, Twitter, Pinterest and Instagram for the latest updates, offers and features.